As of 2009/10, almost all commercial bicycle tools for measuring bicycle chain wear are inaccurate. This note explains why, and how to build an accurate tool. See Commercial Wear Measuring Tools for a tool that is accurate. See Chain Wear Examples for more details on how chains wear. The following is a schematic diagram of a roller chain. 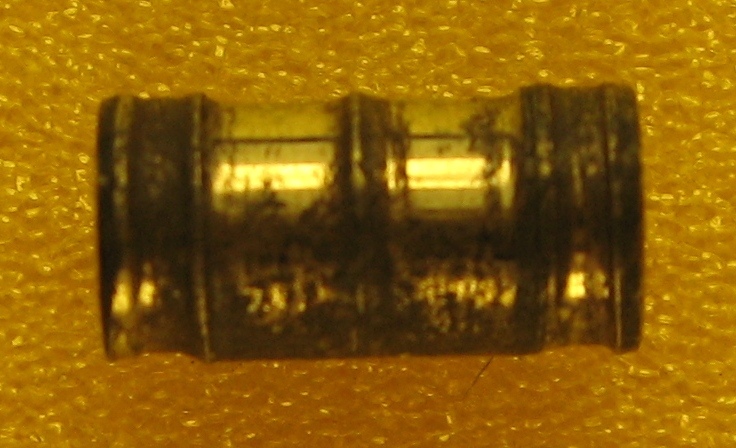 The outer plates are pressed on to pins, forming a single unit. The inner plates are pressed on to bushings, forming another unit. Pins rotate inside bushings, allowing the chain to flex. Rollers are a hoops which rotate around the bushings, allowing the chain to roll easily (with low friction) on and off the teeth of sprockets. In some ``bushingless'' chains (also called ``bushless'' chains), the bushing is formed from the same piece of material as the inner plates. The following discussion applies to both bushing and ``bushingless'' chains. For the rest of this note, the term spacing refers to the distance between rollers. A chain has a nominal spacing. 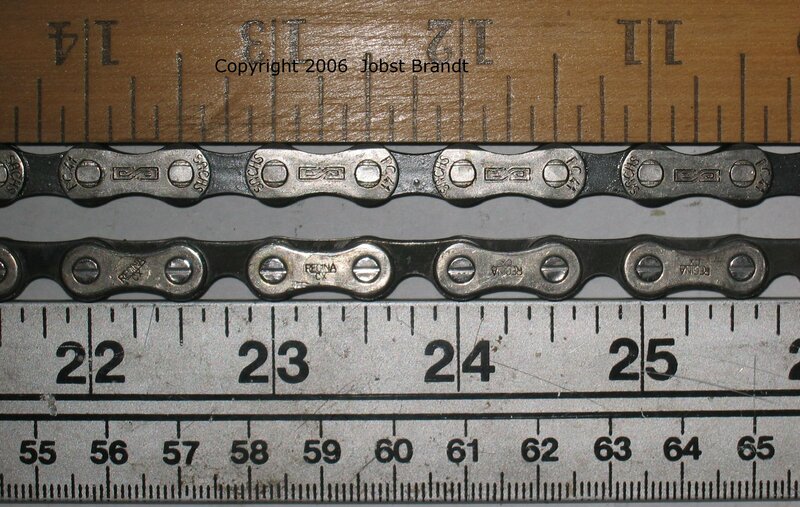 For example, new bicycle chains have 1/2-inch spacing, meaning the chain has a roller every 1/2 inch — 0.500 inches. As the chain wears, the spacing increases. For example, a chain for a derailleur bicycle is worn out when the spacing has increased by 1%, giving an actual spacing (spacing) of 0.505 inches. The spacing depends on the size of the chain parts and also on chain tolerances. For example, rollers do not fit tightly around the bushing, and bushings do not fit tightly around pins. Thus, the chain should be measured under modest tension, and if roller-to-roller distance is measured, the rollers should be aligned so all tolerances are biased uniformly. Note that a conventional chain has uneven dimensions. The pin-to-pin distance is fixed by the outer plates. Thus, two pins on the same outer plate always have the same spacing, no matter how worn is the chain. However, two pins connected by bushings and inner plates have spacing that is determined by the amount of slack in the bushings at both ends of the inner plate that connects them. Sprockets have teeth (cogs) and the chain has rollers which rest on the teeth. The sprocket also has a spacing, which is the nominal distance between the faces of the teeth. Since the teeth are arranged in a circle, the tips of the teeth are farther apart than the roots of the teeth. The higher the roller rides on the sprocket, the greater the spacing. Thus, while the sprocket has a nominal spacing, it actually has a range of spacings, from the root to the tip. 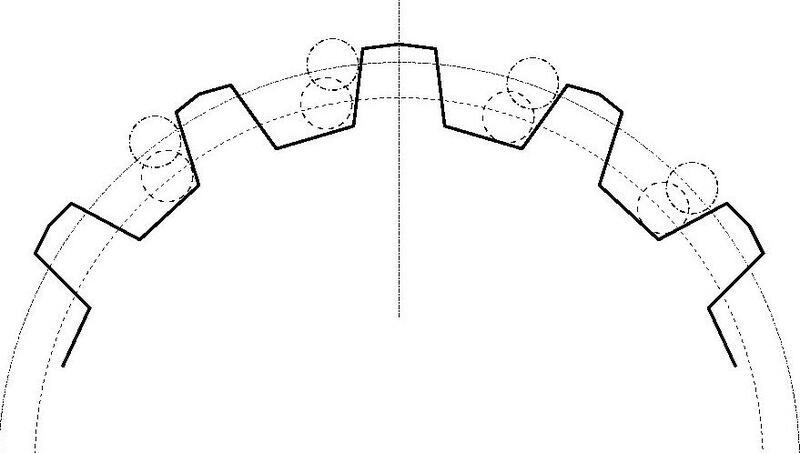 Sprockets are typically designed so the nominal spacing is the distance between the teeth at the ``roots''. As the chain wears, the spacing increases and the chain rides higher and higher on the teeth. If the chain wears too far, it rides too high on the teeth and can damage the sprocket, and can also skip. Measuring chain wear is thus important so you can replace a worn chain before it causes further sprocket damage or makes the bike unridable or unsafe. Note: the actual operation of chains on sprockets is more complex than is presented here. What is presented here is enough to describe chain wear, but is not enough to describe sprocket wear or the engagement of a chain and sprocket. For details, see a professional chains book, for example ``Chains for Power Transmission and Material Handling'' by the American Chain Association, published by Marcel Dekker, Incorporated, Copyright 1982. Let us consider chain wear in more detail. Wear occurs where surfaces rub. One wear surface is where the pin and bushing rub. As the bushing wears, the pin is able to seat more deeply, causing the chain spacing to increase. Similarly, as the pin wears, the bushing is also able to seat more deeply, causing the spacing to increase even more. 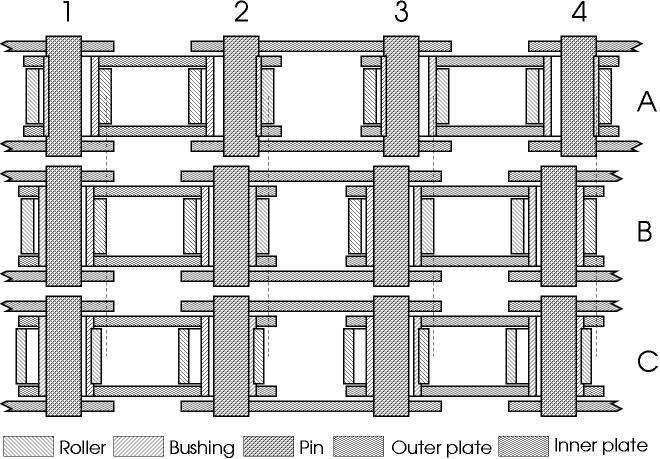 Pin/Bushing wear is shown schematically by A the following figure. 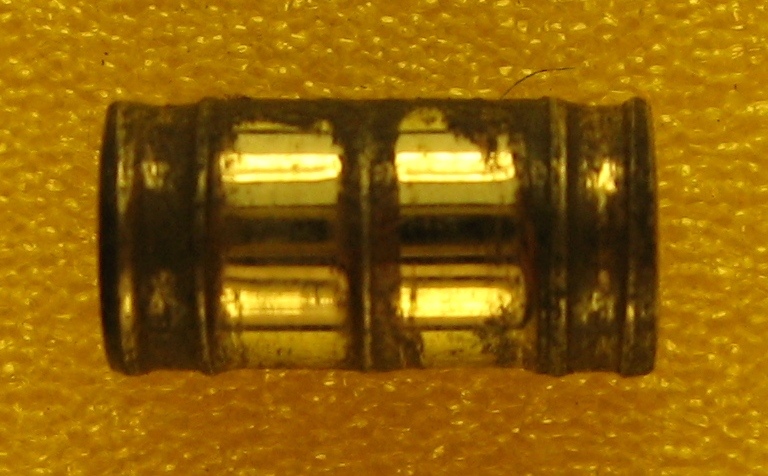 Compared to the unworn chain, B, note that each pin has a wear indentation and that the bushing is worn thinner where it contacts the worn pin. Note also that the pin-to-pin distance is increased. A subtle feature of the wear is that the distance between pins 2 and 3 is unchanged by wear, since that distance is held by the outer plates. However, the distance between 1 and 2 (and between 3 and 4) is double the total wear on each pin and bushing, because the pin-to-pin distance on inner plates depends on wear to both pins and both bushings. A second wear surface is where the bushing and roller rub. The outer surface of the bushing wears and the inner surface of the roller wears. 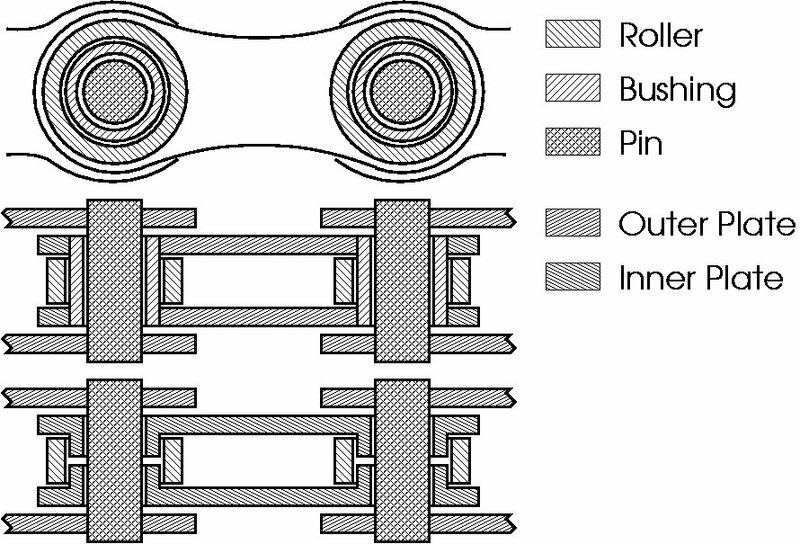 Such wear causes rollers to get looser and looser, and also causes rollers to shift relative to the unworn chain. However, the spacing of the chain remains unchanged. 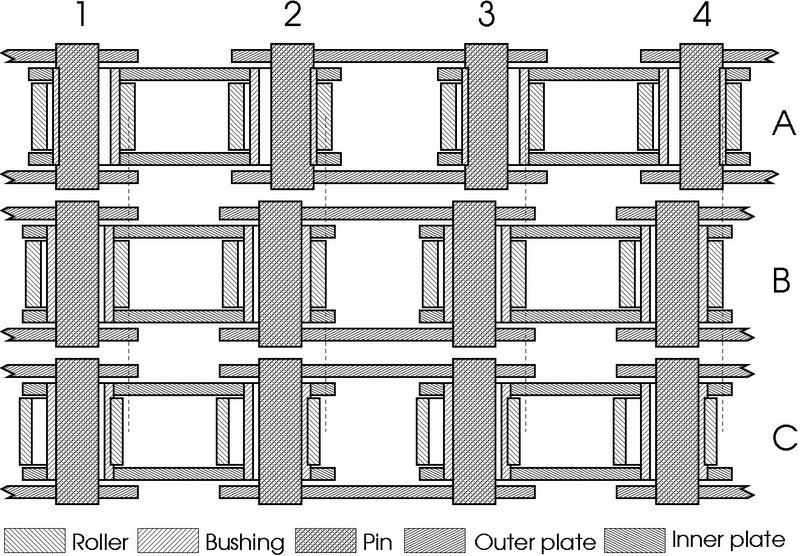 Bushing/Roller wear is shown schematically by C in the following figure. Compared to the unworn chain, every roller is offset slightly to the left, but the pin-to-pin distance is the same as the unworn chain B. That is, roller wear does not affect the chain spacing. The important issue of chain wear is that the spacing changes, causing the chain to ride up on the sprocket teeth. Thus, it is important to measure pin/bushing wear. However, bushing/roller wear does not affect chain performance unless it becomes so severe that it affects structural integrity — the bearing is worn away, the roller fractures, or the like. Thus, bushing/roller wear should not be included in overall wear measurements. 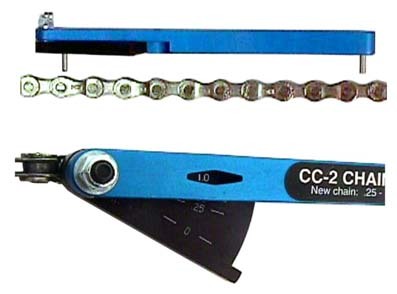 The standard procedure for measuring chain wear is to hold a ruler against the chain. With 1/2-inch spacing chain, 24 links should measure 12 inches new; if 24 links measures 12-1/8 inches, the chain has worn about 1%. Using a ruler can be error-prone because it is necessary to hold the ruler precisely and measure one end while making sure the other does not slip. 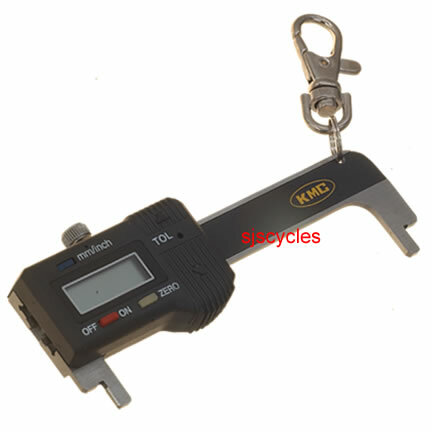 For that reason, several companies have developed chain wear measuring tools. 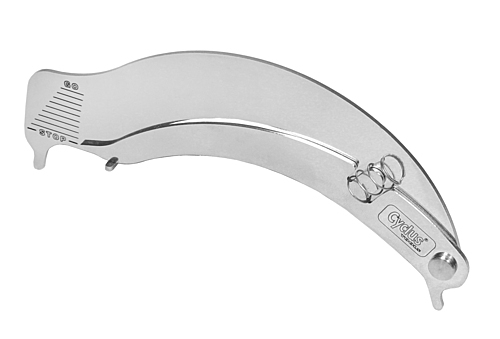 The advantage of a special-purpose tool is that it is faster to measure wear. Unfortunately, as of 2009/10 only one commercial bike chain wear measures just pin wear. The usual approach is to spread several links of chain by pushing the rollers apart. However, roller wear is added to the measurement, even though it does not affect proper chain operation. The one exception is the Shimano TL-CN40/TL-CN41, which measures only pin wear. 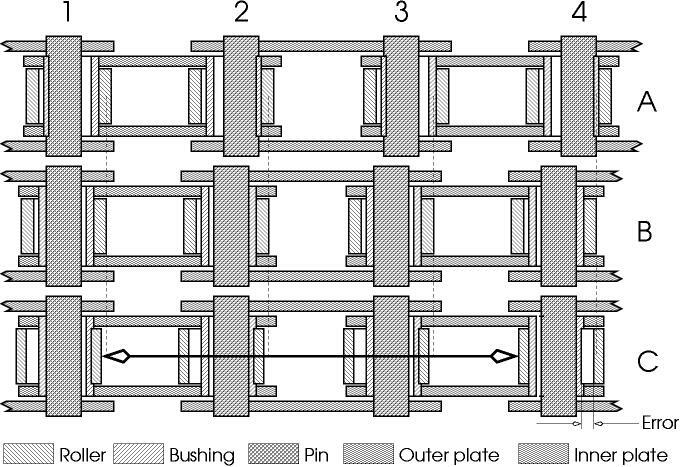 Thus, as shown in the following figure, an unworn chain with loose rollers adds Error to the measurement and thus gets reported as worn even though measuring with a ruler shows there is no spacing change. If a tool is conservative, chains are reported as worn-out when they still have useful service life, which increases chain costs. If a tool is not conservative, then errors mean a worn chain can be reported as good, gets used too long, and leads to drivetrain damage. Commercial tools are conservative and never report a chain as good when it is actually worn. They may, however, report a good chain as worn, leading to increased chain costs. Chain life varies substantially with the type of chain, the riding environment, maintenance, and with the rider and type of use. Further, service life may be short. Riders often report chain life for derailleur chains in the range of 3,000 km to 15,000 km or a range of about 5:1, and some individual riders report a range of 4:1 depending on the type of chain and riding conditions. 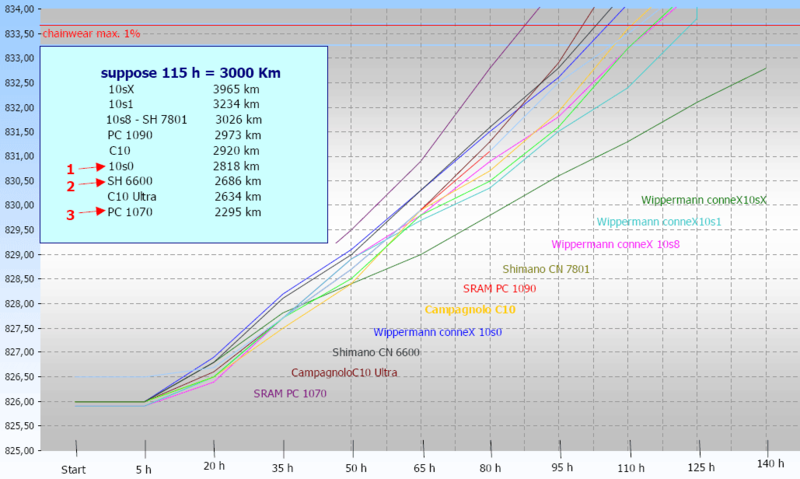 A test at http://www.velimpex.com/wippermann.htm and http://www.velimpex.com/2008promo/triatheletes_connex/chainwear-results-chart.htm reports "Each chain tested was mounted and identically run through the same test designed to simulate 3000 km on the road by a competition-level rider in 115 hours." The report does not describe the detailed methodology, but reports chain life from new to 1% stretch ranging approximately from 85 hours to 155 hours, correspnding to a range of about 2,300 km to 4,000 km. The methodology does not report in detail how the chains were tested, so it is unclear what besides chain type influenced service life. At any rate a range of roughly 2:1 is observed. For reference purposes, a US$30 chain that lasts 3,000 km costs US$0.01/km, similar to the cost for tires. Cyclus offers two models, #720114 and #720062. Both push apart a pair of rollers; measurment error is like that of the Park CC-3 and Rohloff Caliber 2. The KMC uses two plates to push apart a pair of rollers. Measurment error is like that of the Park CC-3 and Rohloff Caliber 2. The Park CC-2 uses two pins that push apart rollers, giving a percentage wear indication ranging from 0.25% to 1%. Measurement error is like that of the Park CC-3 and Rohloff Caliber 2. At least three chain wear tools are ``go/no-go'' gagues, the Park CC-3, Rohloff ``Caliber 2'' and the Sette ST-503. The idea of a ``go/no-go'' gague is that the tool fits (``goes'') if wear is too great; it does not fit (``no-go'') if wear is minor. The following diagram shows these tools schematically. The ``heel'' is set on the roller, then the ``toe'' is moved down. The outer edge of the ``toe'' is made to be precisely the distance for ``too much'' wear. Thus, the ``toe'' only fits behind the roller when there is too much wear. All three tools incorporate two go/no-go measurements. The Park and Sette are labeled "0.75" and "1.0", the Rohloff "0.075mm" and "0.10mm". The ProGold Chain Gauge fits between rollers, and thus is subject to measurment error due to roller wear. It is similar to the Park CC-3 and Rohloff Caliber 2, but instead of being go/no-go, the ProGold reports percentage wear. 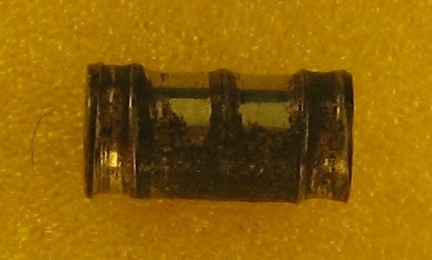 An alternative is very nearly the same design, but with the ``toe'' and the ``heel'' on the same sides of the roller. Again, the ``toe'' is placed precisely at the distance of too much wear. Thus, the ``toe'' only fits over the roller when there is too much wear. 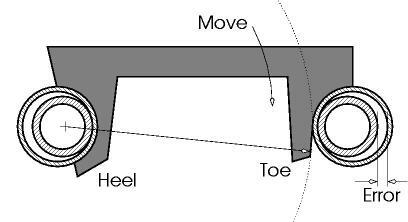 By placing both heel and toe on the same sides, no roller wear error is added to the mesaurement. A disadvantage of the alternative design is that the toe tends to pull the heel away from the roller. Thus, it is necessary to push the toe down only gently. In other words, the inaccurate design can be used quickly. In contrast, the proposed alternative design requires developing some skill in its use. That somewhat reduces its benefit over the conventional design. A third design is the Speedtech CW-1089, which is no longer (2008) available. It uses a hook to fit over the chain and a series of calibrated holes that are matched against the pin to indicate wear. However, it relies on the distance between pin and roller, which may vary if rollers are a different size than the roller size used to calibrate the Speedtech. Pedal forward to tension chain for accurate measurement. 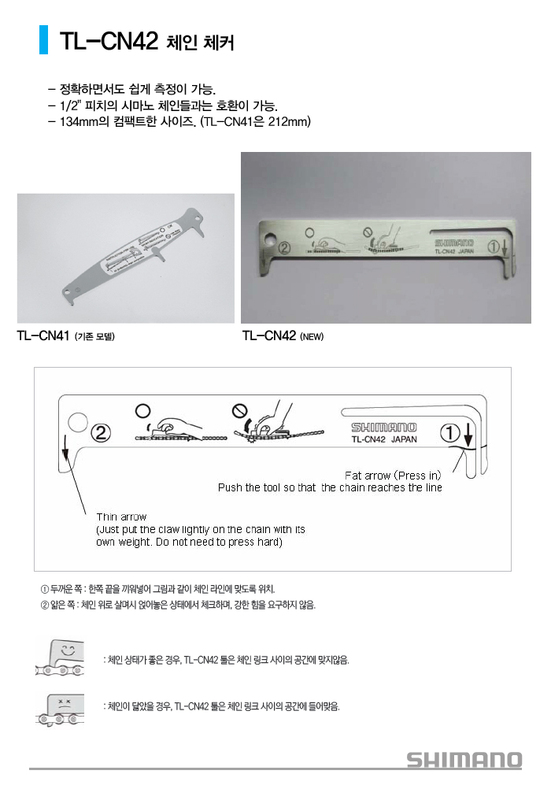 Place chain wear indicator roller set tab on the chain roller. Pivot the tool until a chain pin aligns with a display hole. 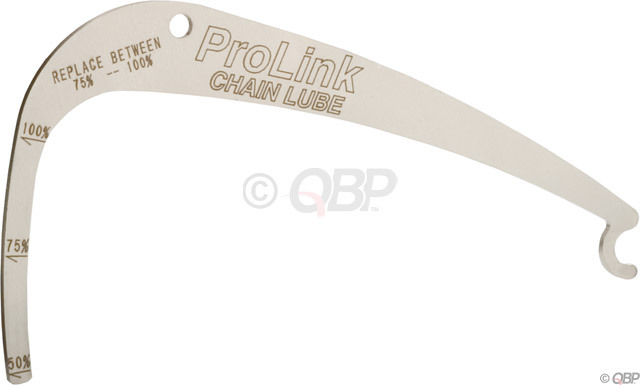 Pass the chain through the width gauge slots on the top of the tool Choose the size that allows the chain to pass through it having minimum pin clearnace. 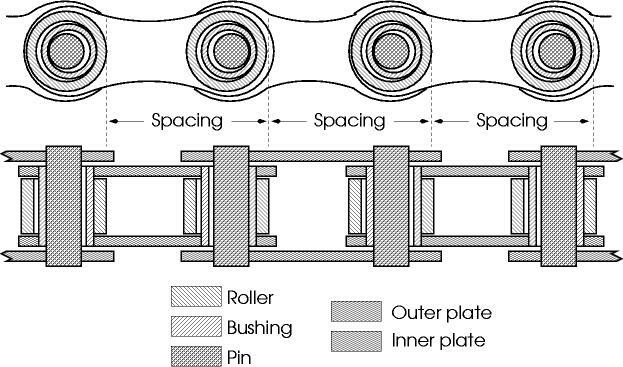 Chain wear occurs at the pin and around bearing pivot points as the chain travels around the sprockets. The wear on the pins and bearing surface is measured as elongation — the more the chain wears, the longer it becomes. 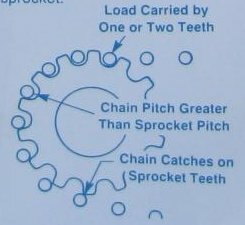 As chain wear increases, the pitch of the chain becomes greater than the pitch of the sprockets. causing fewer teeth to contact the sprocket teeth. This increases sprocket wear and decreases transmission efficiency. A worn chain can periodically catch on the tips of the rear wheel sprocket teeth, slipping over the sprocket before engaging. Slippage also occurs when a new chain is mated with a worn rear wheel sprocket. The Shimano TL-CN40 and TL-CN41 are accuarte, because both measurement points are on the same side of the rollers, so roller wear does not affect measurement. 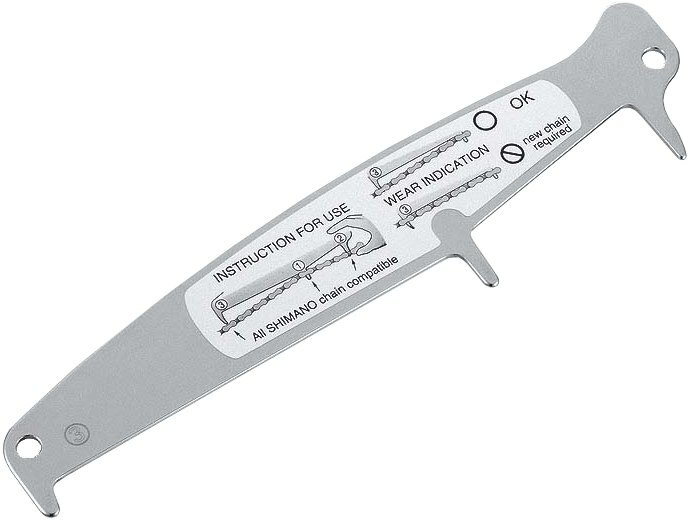 The Shimano TL-CN40 and TL-CN41 appear to be identical except that the latter has instructions on a sticker on the tool. The TL-CN40 forces a center guide against the roller so that when a measuring guide is held against the chain, it measures on the same side as the loaded roller, thus measuring only pin-to-pin wear, as desired. 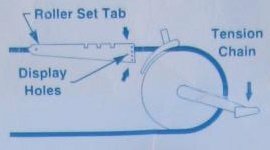 the measuring tool is rocked left or pushed down gently so tab (3) engages the chain by pressing on a roller — notably, on the same side of the roller as tab (1). The TL-CN42 appears to be a modified version of the TL-CN40/TL-CN41. It appears the operation is to slide in the split "heel" at end (1) then gently drop end (2) to either go or no-go. It is thus similar to the proposed alternative. The split end appears to be designed to ensure end (1) is fully pushed against the roller, to ensure alignment. It is thus like the TL-CN40/TL-CN42 pair (1) (2), while the TL-CN42 end (2) is like the TL-CN40/TL-CN41 end (3). The Wipperman is a go/no-go tool that is placed on the chain. If it lies flat, the chain is worn 1% or more. Measurement error is like that of the Park CC-3 and Rohloff Caliber 2. The following photos show a pin removed from an in-service bushing-less chain. The pin corroded where there is not substantial wear, and shiny where there is wear. The center section is significantly worn. The pin was originally smooth in the center but has worn where the inner plates rub on it, and there is now a significant center ridge. The photos also show a dark horizontal line, but this is an artifact of the lighting — in reality, the there are two broad shiny areas rather than four smaller areas. 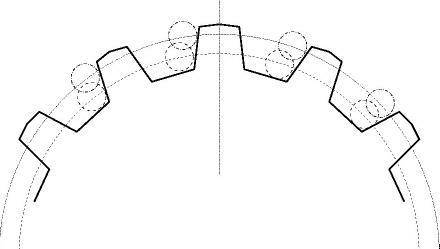 The total width of the inner plate wear area is reduced by about 15% because the side plates do not wear all the way to the center. Chain wear is roughly proportional to area, so this represents about a 15% reduction in service life compared to ideal. The smaller contact area also means increased pressure per unit area, and may result in higher chain friction. The "side" photos also show the pin is shiny on the back side where the outer plates rest. In classic chains, the pin is held tight in the outer plates. 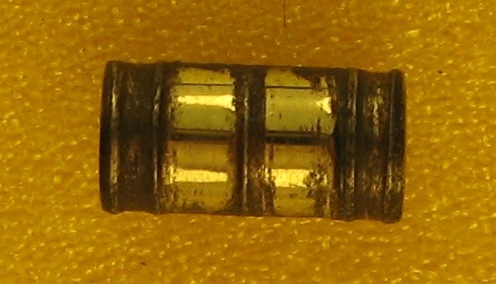 The outer plate wear pattern shows this pin is somewhat loose and moves under load. Since the outer plate area is narrow, it will wear more quickly under a given load. The following picture shows side plates with the bushing removed, to show the gap. 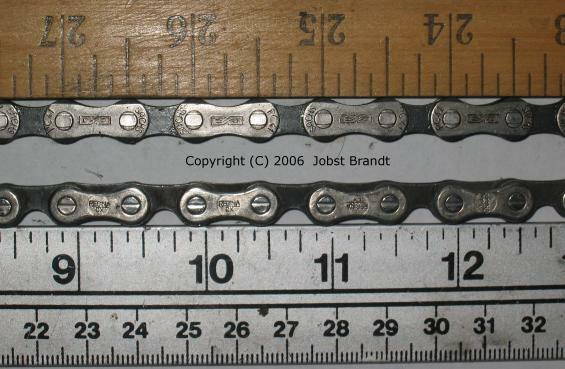 The following picture (click to enlarge) shows worn and unworn chain links. Notably, the inner plates are quite worn where the roller rubs on it. This appears to be in part because the side plates are narrow where they contact the roller and the pin. 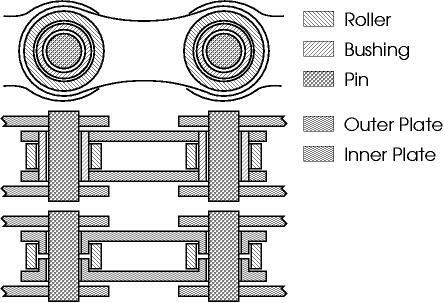 Roller/bushing wear is not typically important for overall chain life (see above), but the narrow wear surface likely translates in to slightly higher friction. Thanks to Jobst Brandt for discussing chain wear, Regina CX-S photographs, and for reading and commenting on earlier drafts of this note. Thanks to Aaron Goss for describing the Speedtech.